About a month ago, I got some really strange insects to my blacklighted sheet while out doing moths one night. 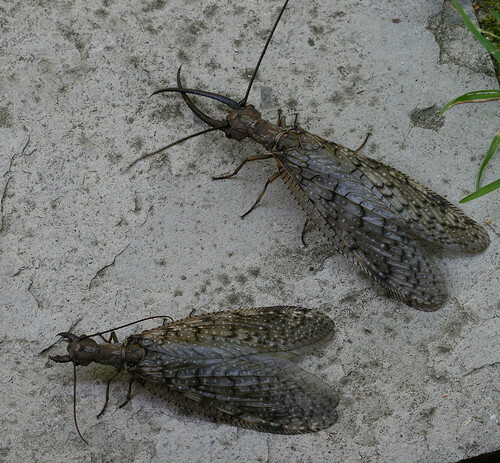 Long, gray bugs with giant wings and feathery antennae, I wrote about them in this post. They turned out to be fishflies, a group of insects I’d previously never heard of. 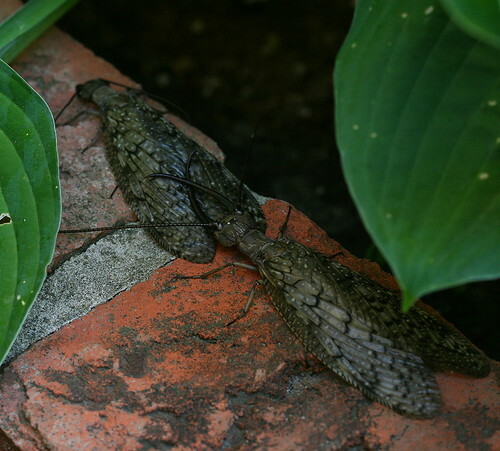 This weekend I found their cousins, the dobsonflies. 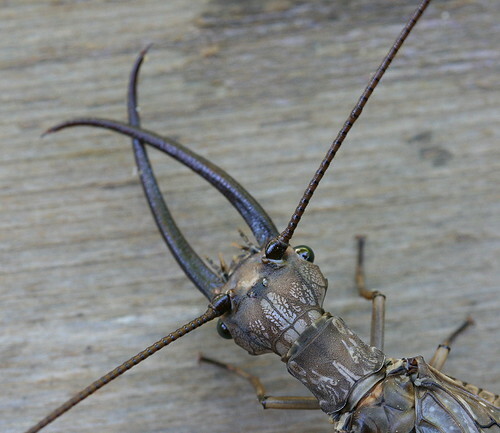 I had actually heard of dobsonflies before, because one of the reviews I’d read for my new macro lens, prior to buying it, had had a close-up photo of a dobsonfly head. Still, I’d never actually seen one myself. There were four of them, three females and a male, attracted to bright white security lights on the side of a large building out near where Blackburnian’s mom lives. 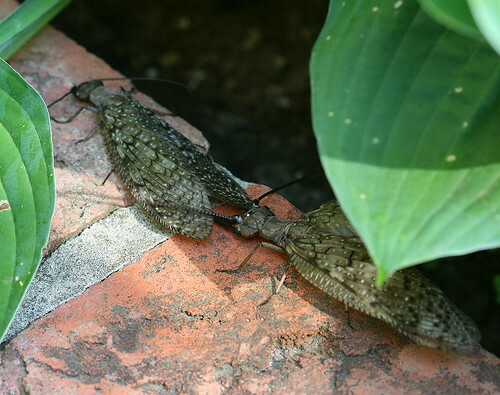 These happen to be Eastern Dobsonflies, Corydalus cornutus, the only species to occur in eastern North America. The other three North American species are found primarily in the southwest. In the photo above there’s a male and a female. The male is the guy with the giant mandibles. The females were all mostly quite low to the ground and easy to reach. The male was another story, he was up near the top of the wall and I had to stand on a box and reach up with Blackburnian’s shoe to gently knock it down to a level where I could reach it. He was the one I really wanted, though, because he’s so impressive. Males reach about 4 inches (10 cm) long, nearly a quarter of which is the mandibles. Females are only slightly smaller at just over 3 inches (7.5 cm). I plucked one of each of them up, pinching their wings together over their back. When I snagged their wings they both reared their heads back, trying to grab me with their mandibles, or at the very least startle me. I knew that their wings were long enough that I was out of reach, so I didn’t buy into it, despite the ferocious appearance. While the female might be able to give you a pinch, the mandibles of the male aren’t really built for biting and can’t really do much for you. Most sources I read say that the adults don’t eat; however, one said that an older research paper indicated they would feed from honey water solutions or have been found at fermented baits (like what I’d put out for moths in cold weather). Either way, they’re not hunting their food. 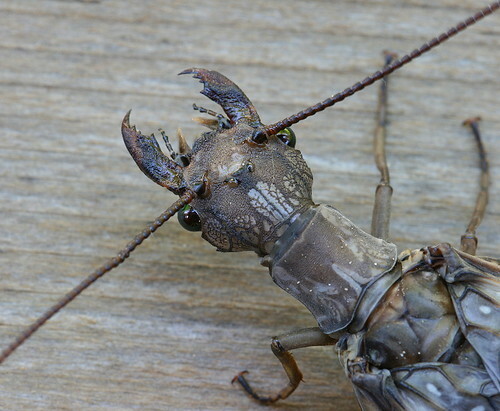 The male’s mandibles are, if anything, even more ferocious-looking than those of the female. As Blackburnian described them, the creatures look prehistoric. Given that they’re not used in eating, what are those huge mandibles actually used for? A commenter to my fishflies post suggested that they have a role in mating. Searching the net turns up little additional information. Many sites simply say the long pincers are used to grasp females during mating. One suggests their impressive length has developed through sexual selection, used to impress the ladies. 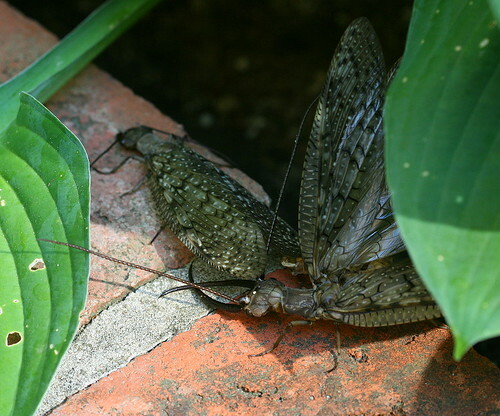 Another indicates the mandibles are used in male-male confrontations, such as in competing for females (whether they actually fence with them or simply show them off depends on the species). I had the opportunity to find out first-hand. He dispensed with the foreplay, there was no touching of antennae as described on the pages I read. There was no showing off of mandibles to the female. In fact, the female seemed completely disinterested through the entire session. She just sat there, not moving, her antennae folded over her back, reminding me of how a mammal who is feeling unamused will lay its ears flat. I bet if I looked closely I could’ve seen her rolling her eyes. The first thing the male did upon making his discovery was (as the first linked site said) turn perpendicular to the female and lay his long mandibles across her back. But he didn’t just rest them there, he appeared to actually put pressure on the lower half of her abdomen and then slid them backwards along her wings to the wingtips. He did this several times, and I presume the purpose was to squeeze out the spermatophores of any competing males. 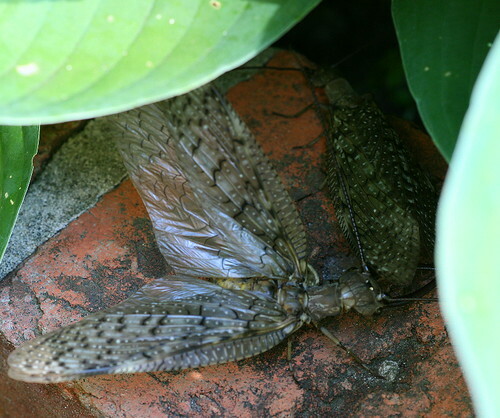 Dobsonflies transfer sperm in the form of gelatinous balls, so it would be fairly easy for a male to remove any left by a previous male, in order to ensure that his own sperm are the ones to fertilize her eggs. A lot of species, both invertebrates and vertebrates, will employ a similar strategy. I finally decided it might be worth getting my camera to record. When I returned, he was reaching under the female’s “skirt” with his mandibles. I couldn’t tell exactly what he was doing – perhaps checking for the presence of a pre-existing spermatophore? Removing it, if there was one? Once he felt satisfied with whatever he was checking for, he started fluttering his wings and curling his abdomen around toward the female. He tried to tuck it under her wings to make contact, but seemed to be having trouble for some reason. Actually, it looked to me that his abdomen just wasn’t long enough to do what he wanted it to do (isn’t this a common feeling with males?). He seemed reluctant to remove his mandibles from under her wings, which appeared to be the main problem, to me. After making a few attempts from the left, he decided to try from the other side. He shuffled over and swung around to face the other way. Again he checked under her wings first. Then tried from the other side. This time he removed his mandibles from under her wings so he could straighten out and reach better. Success! During all this he was fluttering his wings like crazy and generally obscuring the female from view. From what I could see, she continued to simply sit there. It seemed funny that the mating of something with such a long, flexible abdomen would be of the facing-opposite-directions sort, rather than the male above (or below), facing the same direction, and simply curving his abdomen down to meet the female’s. It didn’t take long, perhaps ten or fifteen seconds, and then he turned himself around again to face the female. Finally, he rested his mandibles across her abdomen and they both sat there, still. I checked on them a few times as I went about photographing the rest of the moths I’d caught, and they stayed like that for at least ten minutes. Eventually when I went back the female had crawled off the top of the brick into the shade of the side, but the male remained where he’d been. I assume that this was the male mate-guarding the female until the spermatophore “took”, to prevent other males from removing his sperm before they had a chance to fertilize the eggs, despite what I’d read on one site suggesting it hadn’t been observed in the species. I thought this whole thing was so neat. You know, it’s one thing to just simply see a species (cool as this species happened to be), but it’s quite another to observe a behaviour. Something I’m often guilty of, I find I tend to breeze by, looking at but not really watching what I’m seeing. I’ll identify the birds, for instance, often simply by ear, but I won’t really pay attention to what they’re up to unless there’s some commotion or something to draw my attention. It really is something I should do more – stop and smell the roses, as they say. Wow. That was simply fascinating. We’re going to set up a blacklight next week at Audubon. I can’t wait to see who shows up. I hope I can get some photographs as nice as yours… though I haven’t had much luck with nighttime photos… I’ll try, though! What a fine series of photos with your account of the breeding behavior of the Dobson fly — worthy of consideration of official publication, if integrated with what is already known of this behavior. Do you know how your observations compare with what others may have reported in the literature ?? I like your style of observation with its wealth of detail. Your photos are exceptionally fine. Fantastic images….love the motion blur. Interesting, as always, and not without some wry humour! I’ll have to tell Goodbear about this post; she found some palo verde beetles in her backyard, and pointed out the different lengths of antennae on them. Good luck with the blacklight, Winterwoman! This is a great time of year for all that sort of stuff, I’ll look forward to hearing about what you get! I’m not certain just how detailed the official publications on the subject are, Cestoady, but it would certainly be worth looking into, and thanks for the suggestion! Being more familiar with bird publications, I’ll have to investigate what would be appropriate. Thanks for mentioning Goodbear’s post, LavenderBay – those are some crazy large beetles, can you imagine finding that on your garage door? Thanks for the great article! Last night, I was out on my patio and found one of these ferocious looking creatures. Since last night, I have picked up 8 of them. Mostly males. 2 walking along my privacy fence. I do live about 1/2 mile from a large river. It’s nice to be able to read about these misterious creatures. What a crazy summer this had been. I rescued 3 Cooper’s Hawks a few weeks ago on my property. I’ve certainly learned a many new things in the past few weeks and haven’t left my yard. Glad you found it helpful, Karen! Sounds like you’ve had lots of neat stuff happening around your home this summer. A very informative article and fantastic photos. Thank you. I’ve had both males and females attracted to my porch light, but never a pair at the same time. Thank you for these photos and information. I searched many places for an identification of these large winged insects, and came up blank. Your site was the only one with info on them. I wanted to print your article to show to some of the people at work who saw this “creature” and wanted to do away with it, until I rescued it on a twig and removed it from immediate danger. I could not however print the words. Is this deliberate, or am I doing something incorrectly? My co-worker found one of them at work today. Our office building is no where near water and in Maine no less. After trying to research them on the web I ran into this post. It was very helpful. There definitely is not much about them out there. Thanks for the in site. Ashley Rideout in Milo, Maine. 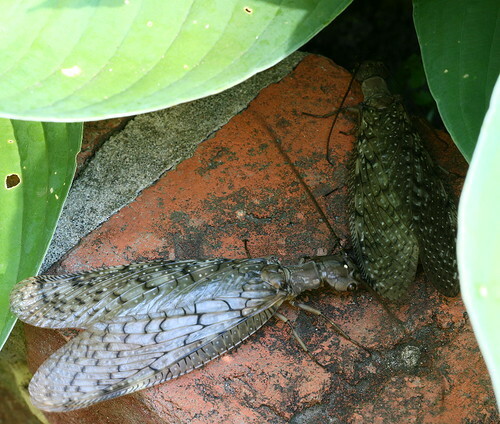 Pingback: Male Dobsonfly | What's That Bug? We found one of these bugs in Madison County, MO this weekend, sure is a strange looking one but interesting. I just found one of these monstrous insects on the side of the house yesterday and had never seen one before. Your site helped immensely in identifying and learning more about it. Fascinating stuff. i loved reading this so much! i’ve seen plenty of dobsonflies but never bothered to learn anything about them. so thanks! it’s also really cool that you got to observe firsthand something that apparently wasn’t clear to other researchers. Your article on these HUGE insects was very informative & interesting. I live in East Tennessee & had never seen one of these before until tonight. I was pumping gas as my stepson was goofing of around the car. When I had finished with the gas, I walked in front of the car where he was & that’s when I saw it. It scared the bejeebies out of me. Automatically it is instinct for me to get freaked out by a big insect, however this one was enormous. 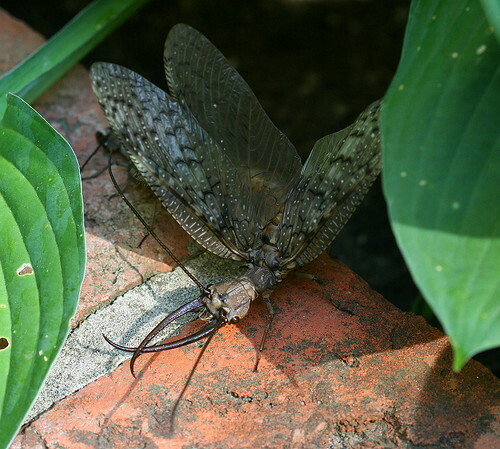 We were able to capture some photos of the male dobsenfly. We were amazed not having seen an insect this large before, or not around here anyways. I wanted to know what it was so I Google the description & I was lead here after a few other sites without information on them. You eased my mind on them possibly being dangerous(Haha)my stepson thought the mandible were pinchers. Thank you for creating this great article. Without it, I may have never known what they were or anything about them. Wondrous & interesting creatures. I have kept a few of these, and I did observed a female specimen burrowing her head into a mulberry and eating the insides. 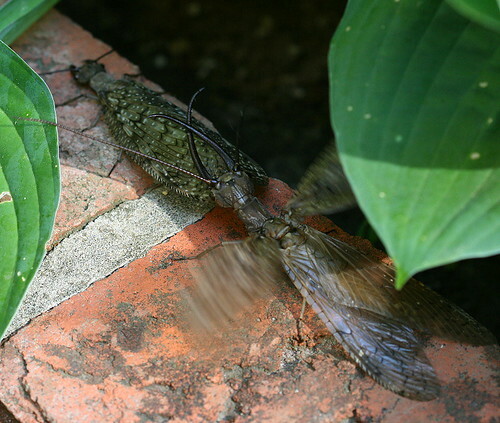 Next time I have a basement, I want to try the improbable and raised him from hellgrammites into dobsonflies. This was wonderful to read, by the way. Previous Previous post: Why am I (still) (bird) blogging?